HeyPlantMan! Exotic Tropical Plants from St. Pete FL: Rainy Days in August ! Rainy Days in August ! We are finally getting some much needed consistent rain lately which makes gardening a challenge to do in between rain drops ! 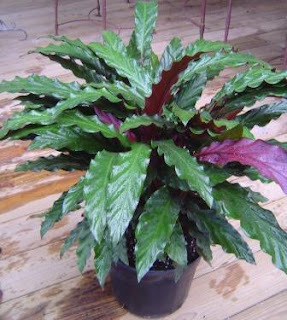 This lovely ladypictured is a ruffly Calathea...gorgeous coloring and soft silky texture on the leaves. Great for shade outdoors, or excellent indoor specimen. Our summer market season continues, so hope to see you all down at the Mahaffee garage. Market hours are 9am-1pm. Although we sold a lot at our yard sale last week, we still have plenty of great plants looking for good homes !